ANIMAL NATION DOESN'T KNOW ANYTHING. : Albums of Influence - De La Soul's "3 Feet High and Rising"
Albums of Influence - De La Soul's "3 Feet High and Rising"
I listened to maintstream, (including, I'm sad to admit, the first 50 Cent album way too many times). I listened to every underground artist I could find, from Apathy, to Atmosphere, to Louis Logic, to Josh Martinez, to Zion I, and beyond. I listened to weird nerd-core hip-hop like Anticon's Dose-One. That being said, around 2004 Crunk Music came into fashion, and I felt fucked. I felt like I'd been thrown on my back, chained up, and gang raped by what is easily the worst kind of music I've ever heard in my life, ever. I didn't get it... I thought all hip-hop was amazing? Why was this horrible music tarnishing something I held so dear? I felt fucked, and I felt alienated, and I stopped listening to 90% of the hip-hop I'd been so in love with only months before. I spent the next 2 years listening to the Beatles, and the Stones, and Bob Dylan, and Radiohead, and Broken Social Scene, and all the other non-hip-hop stuff I've mentioned on this page, and every time I heard that familiarly beautiful hip-hop sound, it would be accompanied by some douche shouting "Yeahhhhhaaa!! OKAYYY!!" and I would wonder what the heck is wrong with the people that buy these records. So how does any of this have to do with De La Soul? After holding a serious contempt for hip-hop for nearly 2 years I heard something amazing. Throughout all those years of seeking and listening to every bit of hip-hop I could find, I managed to somehow never come across anything like De La, or a Tribe Called Quest, or Arrested Development, or even the majority of the freakin' Beastie Boys, and as soon as I heard De La's "3 Feet High and Rising" I realized that there was, and is, still so much amazing hip-hop music hiding out there. It's just not what's being played on MTV (for the most part). De La showed me that hip-hop doesn't have to take itself so seriously. De La showed me that hip-hop doesn't have to involve guns or wearing chunks of metal in your mouth. 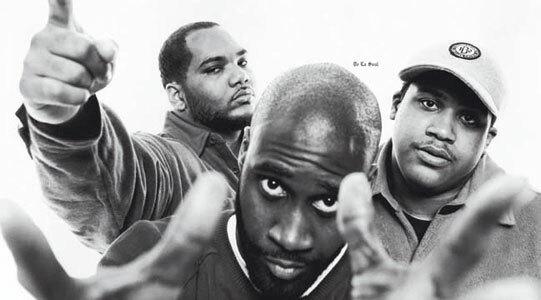 Basically, De La Soul is FUN. Download the entire 3 Feet High and Rising album here for free, then buy another De La record.. maybe some Arrested Development, and definitely hit up a Tribe album or two. Also - Check out our song Sky Fish (video below), as it was directly influenced by De La's "3 Feet High and Rising". 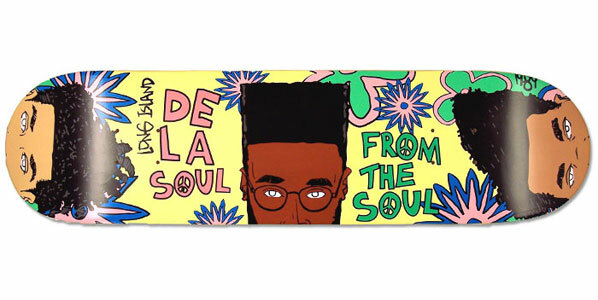 Other AMAZING De La albums include De La Soul is Dead, and Buhloon Mindstate. New EP on CamoBear Records! OUT TODAY!